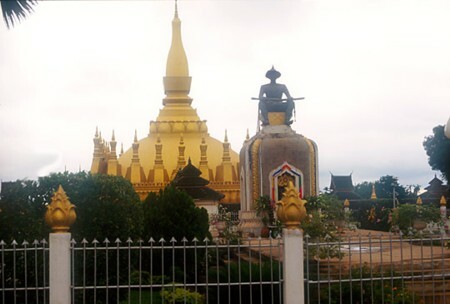 In the mid-16th century King Setthathirat moved his capital from Luang Prabang to Vientiane and ordered construction of That Luang. Work began in 1566. Covered in gold leaf, it repeatedly was plundered by Burmese, Siamese and Chinese. The present structure is a French-directed reconstruction from the 1930s--made to replace an earlier botched French reconstruction of 1900-- and is based on the detailed drawings from the late 1860s by the talented French architect and explorer Louis Delaporte. There three levels, each conveying a reflection of part of the Buddhist doctrine. The encircling cloister walls are almost 279' along each side and contain a large number of Lao and Khmer sculptures.